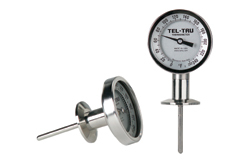 Sanitary Bimetal Thermometers | Tel-Tru Manufacturing Co. These heavy duty thermometers meet to 3-A Sanitary Standard Number 74-06 requirements for sensors and sensor fittings and connectors used in milk and milk products. 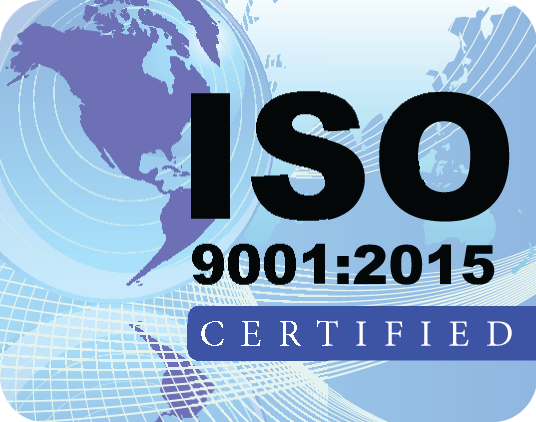 Other applications include food and beverage processing and the pharmaceutical industry. TO ORDER, CLICK ON THE STEM LENGTH LINKS BELOW. Thermowells are not required because a Tri-Clamp® sanitary fitting is integral to the thermometers, reducing installation and instrument costs. 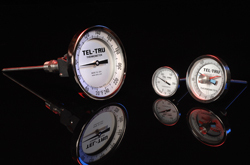 Tel-Tru sanitary thermometers offer the utmost in critical temperature measurement, and can be customized for practically any sterile system. Stem Lengths: 1-5/8, 2-1/2, 2-3/4, 4-1/2, 7-1/2, 10-1/2, 13-1/2, 16-1/2, and 22-1/2". Stem Diameter: .375" standard and .250" optional. Connection: 316SS Tri-Clamp fitting sizes 3/4*, 1-1/2**, 2, 3, and 4". External Reset: Easy to calibrate by inserting Allen wrench into reset opening. Material: 316SS wetted parts, 304SS non-contact parts. Dial: True Anti-Parallax dial, easy-to-read from any angle, minimizes reading errors. Anodized aluminum with large black numbers and graduations. Lens: Glass, tempered glass, safety glass, acrylic, or polycarbonate. Accuracy: ±1% full span per ASME B40.3 Grade AA. Over Temperature Limits: Up to 250°F 100%; 250°F to 550°F, 50%; 550°F to 1000°F, continuous use up to 800°F, intermittent use over 800°F. Pressure Tested: Up to 250 psi. Surface Finish: All wetted parts, max. 32 micro-inches (.80 microns) on stem, weld radius, and underside of flange, per 3A Standard 74-03. * Used on both 1/2 and 3/4" lines. ** Used on both 1 and 1-1/2" lines.